I started to play guitar when I was 14, and I’m 47 now. I started out on electric and acoustic, mostly ’60s-’70s rock. I loved blues-rock, too, and rootsy stuff like The Dead, The Band, The Allmans, so I got into the blues and folk stuff that way, like checking out this guy Robert Johnson that the Stones were covering. I’m probably like a lot of other folks in that regard. I got into fingerpicking in college. W&W : What kind of stuff were you playing in your college years? Was it related to the blues and traditional based music that you’re playing these days? In college, I had a musical household my senior year with two of my best buddies, Eric Goodenough and John Gospodarek. Eric was really into the old country blues, so we all were hard into Gary Davis, John Hurt, Robert Johnson, as well as the more modern guys who were influenced by them, like Jorma, Paul Geremiah, etc. Eric also was a good friend of Michael Millard from Froggy Bottom Guitars, which is how I met Michael. W&W : Can you talk about some of your early instruments? What were some of your first acoustic guitars? Boy, I don’t remember the very first one. Probably wicked cheap and Japanese. Later in high school, I had a Guild, I think it was a D-25, good solid guitar. I had one other Guild, and an early-’70s Martin for a little while, then I got a Lowden, which I really liked. I was really into Pierre Bensusan, so that was kind of inspiring. In ’86 I got a Froggy Bottom, and that’s what I’ve played since then. W&W : Well, I did want to ask you more about Froggy Bottom. Was Michael already building guitars when you met? What, then and now, distinguished FB guitars for you? You play two different models, is that correct? Could you describe the sound and feel? Yes, when I first met Michael, it was pretty much a one-man show, I think. Eric had a guitar that he had made with Michael, so that was pretty impressive. Then we met Michael, and he showed us some of his guitars. He had this great little guitar called Piggy that was a really wonderful little fingerpicker, so we all loved to play that one. There’s a lot I really like about Frogs. They have a very full, rich sound. Mine are both Rosewood, so there’s that big, overtone-rich sound to them, but a really nice balance, so they are great for solo players. And my big one, the K model, which is like a J-185 shape, is a killer backup instrument for flatpicking, rhythm guitar. The smaller one is the one I used on Sun Dog, Brazilian with an Adirondack top, a 000-sized or OM-sized guitar. Michael is also very good at working with a player to determine what they want out of a guitar, and what their playing style would respond to, and then building something according to that. I think that’s one of his main strengths. And the guitars are loud, which I really like, too! W&W : I’ve got to say the one on Sun Dog sounds absolutely amazing! Did the Adi take a while to open up? Well, it really was designed to be a test-run for some original tunes. I had borrowed a USB mic, a Blue Snowflake, from a friend of mine, so I thought I’d do a Garage Band recording of a bunch of originals I had kicking around. I just set up on my kitchen counter. No fancy placement, I just put the mic on the counter top, about 4-6 inches away from the guitar, where the neck meets the body, pressed “the red button”, and off we went. I certainly had been practicing and polishing the tunes a bunch in anticipation of laying them down, but I was a bit surprised that it went as well as it seemed to. When I played it for folks, everyone seemed to like it, so I had it professionally mastered by my friend Chris Magruder, who runs a great little studio here called Thundering Sky, where I’ve recorded other stuff. It was a very relaxed environment, just a guitar, me, maybe a beer, and no expectations, no clock ticking. I did some tunes where parts were improvised, and it all had a very comfortable vibe. So that was satisfying, too. W&W : That’s what I’m talking about, a classic fingerpicking record! A lot of the best guitar records from the ’60s and ’70s seemed to be recorded in peoples’ kitchens and in other casual settings. Sun Dog really does sound great, though. I would never have guessed that it was a plug n’ play, Garage Band situation! It really says a lot about how nice your guitar sounds, but mostly the richness of your playing. Well, thanks, you are very kind. The mastering job really helped, too, I am sure. W&W : Your channeling of the John Renbourn feel is uncanny on your original “A Lot of Sir John”. It seems like Renbourn doesn’t really get his due from the modern guitar scene, especially compared to someone like John Fahey or Bert Jansch. If you had just a couple of sentences to try to make a Renbourn fan out of someone, what would you say? What tune or tunes would you have them listen to? Wow. John Renbourn is one of my all-time faves, maybe the top. The first record I had of his was a double LP that come out on Reprise, and that had his first two solo recordings on one LP. I got that in ’81 or ’82, and was knocked out. It’s hard for me to think of tunes rather than albums, but I think that some of the tunes on his second solo album, Another Monday, are really good examples of his fusion of styles… like “Another Monday”, “Lady Nothyng’s Toy Puffe”, and the song “I Know My Babe”. “Lady Goes to Church”, from Sir John A Lot, is another fave. For albums, in addition to those two, I’d say that Nine Maidens is a really great example of his Celtic/English sound. Traveller’s Prayer is also really good in that department. And why not add Pentangle, so then you can get Jansch as well as Renbourn? I am partial to Sweet Child and Solomon’s Seal. I am not sure why Renbourn is less revered by the younger crowd than Bert or Fahey. He’s got a less edgy vibe I think, for one, and his stuff can veer towards a classical/early music thing, which can probably put a few folks off. But I love the way he plays blues, too. Faro Annie is a really cool album, if you like the early ’70s mellow blues vibe. W&W : Yeah, that’s exactly what I’m going for when I put on Faro Annie, and it’s nice to have “Willy O’ Winsbury” in the middle there to folk it up! His Lost Sessions CD, culled from a shelved major label album from the early 70’s, is also great… it’s got the Faro Annie feel, but is upgraded a little, sonically. I think you’re right about the edginess factor, though. He’s not quite the “lone wolf” that Jansch or Fahey comes off as. I should check out Lost Sessions; I have never heard that. W&W : “Atlantic Slack Key” is probably as close as you get to a contemporary fingerstyle feel on Sun Dog… your affection for blues pickers and British Isles players is obvious, but who are some of the more modern pickers who inspire you? Which players would you consider underrated and deserving of more attention in the guitar world? Well, this is interesting. It was actually the Imaginational Anthem series that made me aware that there was this whole underground/indie acoustic thing out there. I checked out a couple of their anthologies, and the two guys who really jumped out at me were Michael Chapman and Jack Rose. So I started to realize that there was a whole scene out there of younger players who had been influenced by a lot of the same guys that I had been influenced by as well. I’m about 8 years older than Jack would have been, but Mr. Chapman is of the same generation as Jansch and Renbourn and man, there’s a guy who should be better known. He’s one of my current obsessions. Of the newer guys, I don’t really know all of them, but I like James Blackshaw quite a bit, and lots of the new tracks on Imaginational Anthem 4 are fabulous. I also really like Arborea, with Buck Curran on guitar, and his wife Shanti on a bunch of stuff, as well as singing. They have a cool sound, and they’re also up here in ME. W&W : Let’s talk about ragtime a little bit. Your “Ukelele Stomp” has a classical ragtime feel to it, the chord changes and the structure… only a few people, David Laibman for example, have attempted to write new rags and keep the tradition moving forward. In your opinion, what does the future hold for ragtime music? I have never tried to do stuff like transcribe the “Maple Leaf Rag” for guitar, or “The Entertainer”. I got into rags through stuff like Gary Davis style playing, Blind Blake, bluesy ragtime, as well as the old country rags of the ’20s-’30s string band era, like “Pig Ankle Rag” or “Dallas Rag”. So I like them when they’re kind of bluesy, and when they groove. I think it’s a great style of playing, and it lends itself to improvisation over a form. And it’s fun to play, too. I certainly hope it continues to be a viable form. It’s a big part of how fingerstyle evolved, too, from a historical perspective, right up there with Piedmont blues. I like taking my background in various musical traditions and trying to use those influences in my original tunes, so that’s another good angle for newer players coming along. Open yourself up to influences from past styles, and learn to speak a bit in that language, or with that accent, guitaristically speaking. W&W : Talk about how you got involved in the traditional and dance scenes… did that evolve out of listening to guitarists like Renbourn and Bensusan, or was it a separate thread of interest for you? That was a big part of it, listening to guitarists like them, and to Irish groups like Planxty and the Bothy Band. And then there was contra dancing, and the groups playing for the dances were using lots of traditional Celtic jigs and reels, as well as New England tunes and old-time music, so I started playing mandolin as well as guitar, and playing some for dances. I played the dance scene for about 20-25 years or so. I learned a ton about playing good accompaniment, keeping solid, driving rhythm, and putting the dance into dance tunes. I actually played and tourned from 2000-2006 with a band called Airdance. We made three CDs, and I also made a duo CD with the fiddler, Rodney Miller. We played all over the US, and in the UK a couple of times. I’ve also done lots of guitar backup/accompaniment over the years for different fiddlers and other tune players. Of course I’ve also been actively involved in a song-oriented duo with my wife, Susie Burke, who’s a great singer and guitar player. We’ve done several CDs as well. W&W : Well, it’s been great talking to you David! Where is the best place for people to pick up the CD? The CD is at CDBaby, iTunes, Emusic, and I’m sure some other sites. They can also order them directly from me, $12 to David Surette, PO Box 433, South Berwick ME 03908. W&W : Thanks again, it’s been lovely! Have a great holiday! Thanks, Raymond. Have a nice weekend yourself. I really enjoy your blog. It’s a very cool site, and you’ve done a great job with it. Thanks for being interested in the music. Enjoyed the interview. Thanks for alerting me to it on the Acoustic Guitar Forum. 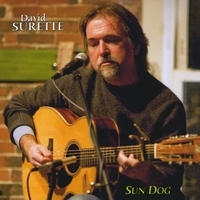 Been a fan of Surette since I heard his wonderful album, “Down The Brae” about 15 years ago. Dave played at my Scot-Irish Fest in upstate NY many years ago (he joined i with “Cherish The Ladies” on stage for a few numbers).